Baby wearing. The truth, it isn’t always as enjoyable as everyone makes it out to be. Honestly, I feel like even just 3 years ago it wasn’t that popular.. I never wore Oliver, partly because he didn’t enjoy it.. or so I thought. You see, if you wear your baby from the start, they feel close to you, can listen to your heart beat, and find it soothing. They may not always seem like they like it, but don’t get frustrated.. they can sense it. It’s new to them too, and you both just have to be patient and work through it. I also don’t believe that you can spoil a baby. Oliver was a very crabby newborn.. constantly cried and was fussy. Always needed to be held and it was extremely exhausting. So after I had Attikus I told myself that I wouldn’t have another baby like that, I wouldn’t spoil him and he needed to learn to self sooth. Now looking back, that is my biggest regret. I wish I would of held him close and coddled him all day long.. it’s not to say that I didn’t love him and snuggle him and give him all the attention I could, it’s just I feel like I gave him a tougher love than I did with Oliver and for that I am regretful. Luckily he’s only one and there is still plenty time to make up for it, but man that mom guilt is the real freaking deal. With that said, I wanted to share my three top baby carriers and why I like each of them. I wear Sonny every day, he sleeps so peacefully so close to my chest and it’s absolutely wonderful because I can play with the boys, tidy up or do anything else I need to “get done”. Truthfully though, wearing Sonny has taught me to slow down. Enjoy that snuggle time with him while also giving quality time to my other two. It allows me to not feel so guilty if I need to clean or pick up around the house because I’m still getting those snuggles in. Baby wearing has become one of my favorite things and I hope we continue to enjoy it together. Pros: The quality of the sling is amazing, super soft and stretchy, breathable and is great for carrying your infant/newborn. You can get their body so snug to yours, it doesn’t feel like their falling down on you, and its most importantly comfortable. You have two arms to do what you want which makes it perfect for around the house. Cons: It’s very long.. I don’t know what other people do when they’re out and about because it hangs on the ground while your trying to put it on and it does take a little bit of practice to put on before it gets easy and quick. I also haven’t used one with an older heavier baby, so I’m not sure what that’s like. Pros: Unlike the solly wrap and the long fabric, the sling is very convenient to transport and take anywhere with you. It’s also pretty easy to put on especially when you get the hang of it.. there are videos you can watch on their site which make learning to use the sling much easier. I use to carry Attikus in the sling a lot because he always liked to be held and he was a bigger much heavier baby so I held him on my hip, the sling is great for holding your babe on your hip while still having two arms free to use. 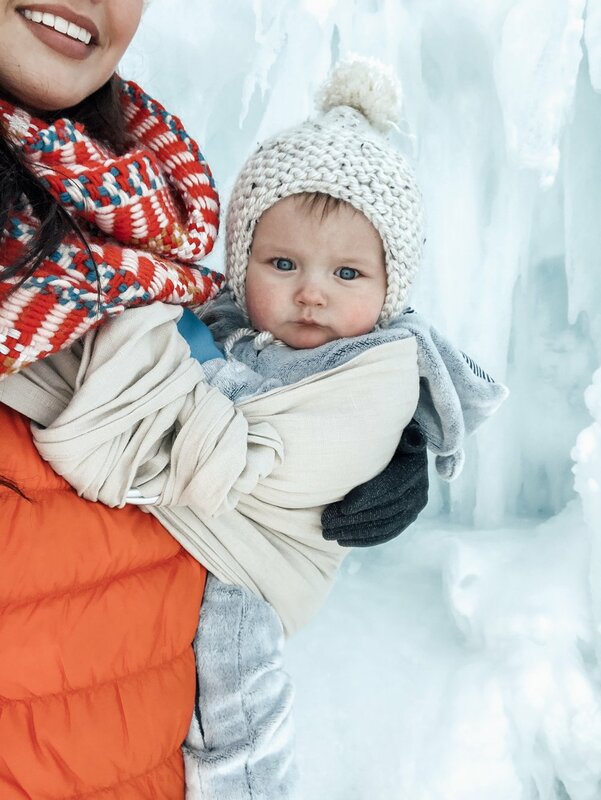 Pros: The Ergo is my all time favorite for travel, long walks, hikes or any type of adventure where you’ll be wearing your baby for a long time. It’s so easy to put on and has the BEST back support. Like literally it provides the best support and is very comfortable and when worn right doesn’t fall down or feel like your baby is falling out. Cons: I don’t really have many cons for this other than it’s a bigger carrier so it doesn’t just fold up nicely into your diaper bag. It also has velcro on it which can get stuff stuck to it, but thats not too bad in my opinion! Overall, if you’re looking for a carrier whether it be a wrap, sling, or carrier.. I would highly recommend any of these brands. There are other brands that I’m sure are very similar to these but I can’t speak for them and just know the ones that I’ve used myself. 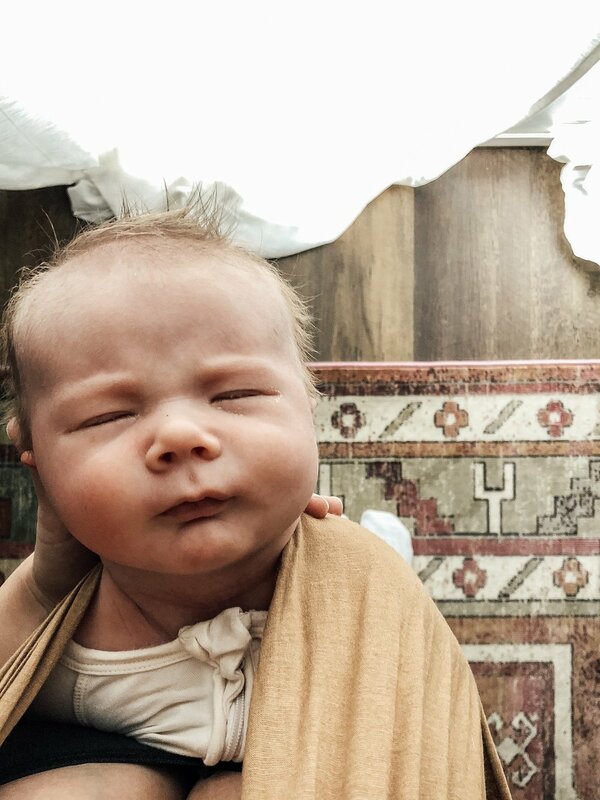 I hope this inspires you to start baby wearing and enjoy those extra snuggles.. because like they say, babies don’t keep. Please note that if you shop through any of the links provided I will gain a small commission and for this I am forever thankful as this small portion of my blog helps provide for my family!